If you’re focused on preparing for your financial future, you probably know you’re ahead of the game. And while socking away your hard-earned cash for a later date may not seem particularly fun, it is important. First, it’s a good idea to calculate how much money you need to save for retirement. Then you can figure out the strategy that makes the most sense for you. While you may often hear that a 401(k) is the best way to reach retirement goals, there are certain times it doesn’t make sense. 401(k) plans are designed for retirement. Once you’ve contributed money to them, if you need to access that money before retirement, you often have to pay taxes and penalty fees. For this reason, it’s a good idea to have a separate fund for emergencies. It’s generally a good goal to have three to nine months’ worth of expenses in cash that is easy to access. The exact amount you need will depend on your job security, income needs and other factors. So before you start diverting all your savings to your 401(k), it’s a good idea to make sure you have a separate emergency fund. Between plan administration fees, investment fees, individual service fees, sales charges and management fees, some 401(k) plans will cost more than you expect. You may not even be making enough in interest to negate these fees. Part of the allure of 401(k) plans is the option to defer income tax until you start taking money out. If you are worried that you will shift up to a higher tax bracket when you retire or do not like the lack of stability in tax rates, you might prefer a Roth IRA. This kind of retirement account allows you to contribute after-tax dollars. When it comes to boosting your retirement nest egg, it’s important to do some research and find out the best way to reach your own financial goals. Labeling a city “most livable” is a pretty subjective assessment — people who love New York may not be crazy about living in Fargo, N.D., for example, but both are on this list. AARP tried to find cities that included many of the factors important to Americans aged 50 years and older. The rankings are based on analysis by the AARP Public Policy Institute and other experts of 60 community factors in seven categories: housing, neighborhood, transportation, environment, health, engagement and opportunity. The analysis included responses to a national survey of 4,500 Americans in that age group about what’s most important for them to have in their communities. Each of the cities on this list stands out in many of the 60 factors AARP analyzed, making them suitable for residents with a variety of tastes. When thinking about a new location, there are several things to consider, beyond what the community has to offer. For starters, you may want to look at job opportunities and the unemployment rate, and if you’re considering buying a home, see if you can afford property in the neighborhood you find desirable. Livability may be challenging to quantify, but affordability is a bit more black-and-white. Financial stability should always be a large factor in making big life decisions. 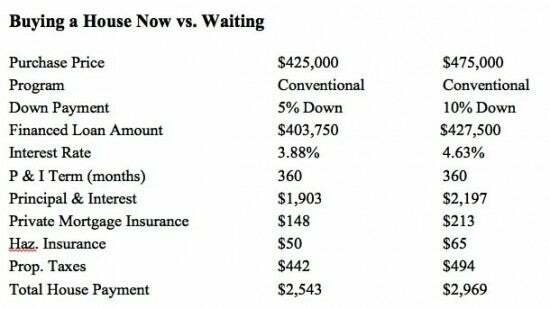 If you have nothing for a down payment at this time, it makes sense to continue to save. However, if you do have the cash now, the numbers may work in your favor. Let’s go back in time a bit to see how this works: Say you purchased a home in 2010 in Sonoma County, Calif., with an FHA loan at 3.5% down. The home value/purchase price back then was $275,000 and you put down $9,625 at closing, the minimum FHA contribution needed. Fast-forward to July 2013. Assuming you took out a 30-year fixed rate mortgage, and diligently paid down your principal and interest each month (since 2010) while the economy gained momentum. At this point you would have accumulated at least 20% equity just by getting your foot in the door. Your mortgage would have been paid down to approximately $255,000 and you would’ve accumulated enough home equity by virtue of the amortization balance pay-down to have an opportunity to refinance. Fast-forward to now, 2015. Housing prices have continued to rise based on real demand vs. supply (not an inflated market created by credit products pre-2007), and now you probably have 40% equity or more in your home, giving you a bigger chance to refinance your house — if you didn’t back in 2013. If you have at least 3.5% of the purchase price to buy a house — or more conservatively, 5% of the purchase price — you can probably make a good case for buying a home, knowing that you’re likely to continue to accumulate equity. Keep in mind, this scenario assumes house prices continue to go up. It represents what the numbers would look like if you were to buy a house with today’s interest rate and housing environment with 5% down, assuming a price of $425,000. Or, if you decide to wait until you’re more comfortable with a 10% down payment, assuming housing prices continue their upward momentum and interest rates follow suit by trickling up, housing will cost more. A $425,000 house today could cost you $50,000 in purchase price for that exact same house and $426 per month more in mortgage payment — even by forking over more cash by the time you have it. The point is, if you can afford a mortgage payment with today’s home prices and interest rates and you have at least a 5% down payment (or 3.5% FHA), as well as money for closing costs, it might better serve you to purchase a house while you can before the same house in the future costs you more because you’re simply electing to put more money in when it might not be necessary. Moreover, if this scenario plays out, you could always refinance your house in the future to take advantage of the additional equity accumulation on a conservative fixed-rate principal and interest mortgage. This article by Scott Sheldon was distributed by the Personal Finance Syndication Network. This article by Lucy Lazarony was distributed by the Personal Finance Syndication Network. What you need: A reliable vehicle, smartphone, ability to pass a background check. What you need: Training ($250-$600), ServeSafe Certification ($40), uniform and bar kit (about $50 together). Lea Hatch, owner of the event planning and bartending company, A Shot Above Entertainment, Inc. says that she, her husband and their staff work mostly on weekends, giving them a full-time income for a part-time lifestyle. “A bartender/server with our company will make a minimum of $80 for four hours,” she says, “but in general we average $100 to $150 per night. Our most lucrative events net us $800 to $1,200 per staff member.” In bartending jobs, income is often heavily dependent on tips, which can vary. What you need: Experience requirements vary depending on position. Companies looking for part-time experienced workers are often in a “high-growth stage” but “hesitant to invest in human capital, just don’t have the work to justify 40 hours per week,” says Ellen Grealish, co-founder of FlexProfessionals, LLC. “Top part-time roles in terms of number of requests are finance (bookkeeping and accounting), administration (personal assistant, office manager, administrative, etc..) and HR (generalist, recruiter),” she says. If you have specialized skills — you are a whiz at Quickbooks, for example — you may be able to bring in $25 to $35 an hour, contract specialists often make $50 to $60 per hour, and some attorneys who no longer want the grind of working full time can command $85 to $100/hour, she says. What you need: Requirements vary, training may be provided. What do you need: Clear background check and drug test, CPR and first aid training, speak fluent English. “Designers with strong portfolios can make incredible money, particularly if they team up with small website marketing firms that build/maintain websites for small- and medium- (sized) businesses,” says Josh Lindenmuth, CIO with the payroll company Payce, Inc. He says one designer he knows personally made over $15,000 a month on the side. “The key was that he became extremely good at churning out great sites fast. He could get done a $1,000 site every two days, while a less skilled designer/developer may take two weeks,” he says. Web design skills — which can be learned online or at local community colleges — and a great portfolio are essential. Designers with special skills can also command higher incomes. For example, motion graphic designers on the marketplace shakr.com earn 70% of all revenue earned (indefinitely) through their Adobe after-effect templates. What you need: Must love dogs! May also need to be licensed and/or bonded, and purchase insurance. Earnings depend on locale and will increase if you can walk multiple dogs at the same time. On the plus side, “It provides plenty of exercise and you will meet new and interesting people on your walks,” says career counselor and executive coach Roy Cohen. “My dog, Oskar, is walked twice a day by a group of folks who are all artists, actors or students,” he says. What you need: Ability to tutor children or adults in specific subjects. “For teachers, ex-teachers, college instructors and grad students this is a great option,” says Cohen. It may help to work through a tutoring company initially to learn the ropes, though pay will be lower than if you work on your own. Increasingly, good tutors can work through online portals, which means less travel to client homes, and those skilled in high-demand areas, such as SAT tutoring, can earn more. What you need: An MBA from a top-tier business school and/or specialized expertise. Marisa Goldenberg, whose education included a computer science degree from Princeton and an MBA from Harvard, often earns $250/hour and up as a consultant to top companies through HourlyNerd.com. “Depending on your experience level and what kind of project you are looking for you can set it up to work as much or as little as you want,” she says. She says she often sprints for a month, working very hard, then takes a break. Whatever side income you pull in, just make sure you save it or use it to strategically pay off your debts. (Don’t make the mistake I made right out of college when I worked part-time in a retail job where I spent a good portion of my earnings on clothes!) Paying down debt can boost your credit scores (and you can get your credit scores for free on Credit.com to track your progress) which in turn can help you get out of debt faster. And that can make all that extra work worth it! A national mortgage servicing company will pay $63 million to resolve Federal Trade Commission and Consumer Financial Protection Bureau charges that it harmed homeowners with illegal loan servicing and debt collection practices. The FTC and CFPB allege that Green Tree Servicing LLC made illegal and abusive debt collection calls to consumers, misrepresented the amounts people owed, and failed to honor loan modification agreements between consumers and their prior servicers, among other charges. Under the proposed settlement, Green Tree will pay $48 million to affected consumers and a $15 million civil penalty. The company also will stop its alleged illegal practices, create a home preservation plan for some distressed homeowners, and take rigorous steps to ensure that it collects the correct amounts from consumers. Green Tree has become the servicer for a substantial number of consumers who were behind on their mortgage payments at the time their loans were transferred to Green Tree. Because homeowners cannot choose their servicer, they are locked into a relationship with the company for as long as it services their loans. According to the FTC and the CFPB, Green Tree’s collectors called consumers who were late on mortgage payments many times per day, including at 5 a.m. or 11 p.m., or at their workplace, every day, week after week, and left many voicemails on the same day. They also unlawfully threatened consumers with arrest or imprisonment, seizure of property, garnishment of wages, and foreclosure, and used loud and abusive language, including calling consumers “deadbeats,” mocking their illnesses and other struggles, and yelling and cursing at them. The company also allegedly revealed debts to consumers’ employers, co-workers, neighbors, and family members, and encouraged them to tell the consumers to pay the debt or help them pay it. The complaint also alleges that Green Tree took payments from some consumers’ bank accounts without their consent. The agencies also allege that Green Tree pressured consumers to make payments via Speedpay, a third-party service that charges a $12 “convenience” fee per transaction, claiming it was the only way to pay, or that consumers had to use the service to avoid a late fee. According to the complaint, in many instances, Green Tree failed to honor loan modifications that were in the process of being finalized when consumers’ loans were transferred from other servicers to Green Tree. This resulted in consumers making higher monthly payments, receiving collection calls, and even losing their homes to foreclosure. Green Tree also allegedly misled consumers about their loss mitigation options. The company told some consumers who were behind on their mortgages that they needed to make a payment to be considered for a loan modification, even for programs that prohibited the company from requiring up-front payments. In addition, Green Tree took up to six months to respond to consumers’ short sale requests despite telling them it would respond much more quickly. These delays caused consumers to lose potential buyers, miss other loss mitigation options, and face foreclosures they could have avoided. According to the complaint, Green Tree misrepresented the amounts consumers owed or the terms of their loans. This included telling consumers they owed fees they did not owe, or that they had to make higher monthly payments than their mortgage contracts required. The company often knew or had reason to believe that specific portfolios of loans it acquired from other servicers contained unreliable or missing information. In many instances, it should have known that consumers had loan modifications from prior servicers and therefore owed lower amounts. And when consumers disputed the amounts owed or terms of their loans, Green Tree failed to investigate the disputes before continuing collections. Green Tree also allegedly furnished consumers’ credit information to consumer reporting agencies when it knew, or had reasonable cause to believe, that the information was inaccurate, and failed to correct the information after determining that it was incomplete or inaccurate – often when consumers told Green Tree about it. obtain substantiation for any amounts collected when consumers have in-process loan modifications, and for purported amounts due when there is reason to believe a newly transferred loan portfolio is seriously flawed. The proposed order also prohibits Green Tree from making material misrepresentations about loans, processing procedures, payment methods, and fees, from taking unauthorized withdrawals from consumer accounts, and from violating the Fair Debt Collection Practices Act, the Fair Credit Reporting Act, and the Real Estate Settlement Procedures Act. The Commission vote authorizing the staff to file the complaint and proposed stipulated order was 5-0. The FTC filed the complaint and proposed stipulated order in the U.S. District Court for the District of Minnesota. Millions of consumers will now be able to receive the credit scores and credit reports that nonprofit credit counselors purchase on their behalf. Nonprofit organizations that offer credit counseling, housing counseling, and other financial counseling services buy credit reports and scores for the consumers they serve. These reports and scores help counselors engage in constructive conversations with their clients about steps the clients can take to improve their financial situation. Until now, counseling organizations have generally been prohibited by their contracts with the credit reporting agencies from giving the consumer the credit report or score that they have purchased on that consumer’s behalf. For example, a nonprofit organization that purchases a credit report with a FICO credit score has typically signed a three-way agreement with one of the three large credit reporting agencies (TransUnion, Equifax, or Experian) and FICO, agreeing not to provide the report or score to any entity, including the consumer. This no-sharing policy is common in contracts signed by business users of credit reports and scores. But when applied to consumer counseling, it limits a client’s ability to review the credit history provided by the counselor on their own and may make the consumer more dependent on the counselor to take steps to manage or improve her credit standing. We’ve heard concerns about this issue from counselors and consumers across the country. FICO’s announcement today signals a change in this policy. FICO has reached new agreements with the three credit reporting agencies that will allow millions of consumers who receive nonprofit credit counseling, housing counseling, and other services to obtain a copy of the FICO score that these organizations have purchased. We’ve been working with industry to make progress on these issues and we are encouraged by this positive step. FICO has taken the additional step to create content to help these consumers understand the key factors that influence their credit scores. These efforts build on our open credit score initiative, which is helping to increase consumers’ access to credit scores and credit reports and empower consumers to improve their financial lives. Last year, we launched this initiative by calling on more of the nation’s top credit card companies to make credit scores freely available to their customers. Today, more than more than a dozen major credit card issuers are providing credit scores directly and freely to consumers, and they are increasingly being joined by other types of consumer lenders as well. As part of this ongoing effort, we brought counseling organizations’ concerns about restrictions on their clients’ access to credit information to the attention of the credit reporting companies and FICO and urged that these restrictions be removed. However, even with the policy change on FICO credit scores, individual contracts between the credit reporting agencies and counseling organizations still prohibit the organizations from sharing the credit reports with their clients. This restriction makes it harder for counselors to do their job. And it keeps the consumers they serve from benefiting fully from the credit information that the counseling service organizations have paid for. We are encouraged that, as part of this ongoing effort to press forward on these issues, Experian is now updating its policy and nonprofit counselors that purchase credit reports on behalf of their consumer clients will soon be able to share that those reports, as well as the scores, with the consumer. We urge the other credit reporting agencies to take steps to make this credit information available as well. Ending restrictions on sharing credit scores and reports by consumer financial counseling organizations will empower consumers to take more control of managing their credit and help counselors to do their jobs more effectively. Learn more about credit reports and credit scores on Ask CFPB. Also, remember that consumers can always obtain a free annual copy of their credit reports. This article by Daniel Dodd-Ramirez was distributed by the Personal Finance Syndication Network. What Does My Debt Cost Me? Have you ever asked yourself the question, “What does my debt cost me?” Borrowing money does cost you. You may be paying all your bills on time and have a good credit score. But, don’t kid yourself; you pay a price for being in debt. How much do those loans cost us? We went to industry sources to get some typical rates. mortgage using a 15 year fixed is 3%. Don’t worry about how accurate the debt totals or interest rates are. That’s not important. We’re just illustrating how much being in debt can cost you. You may owe more or less. You’ll need to do your own calculation. You’ll probably want to add in any auto, boat, or home equity loans. You’ll probably need to convert some interest costs, so they’re all either monthly or annual. Let’s take a look at our test family. The cost of their debt is $7,856 per year or $655 per month. Most people are surprised at how much their debt is costing them, especially if they have more than one account. How much is your debt costing you? And what would you do with it if that money were available to you each month? You probably have some good ideas. I’d be surprised if you didn’t. So what’s your cost of debt? And what are you willing to do about it? Do you need to get out of debt? Would a step-by-step course help you? We want to help. The Dollar Stretcher’s Get Out of Debt Course is designed to help you determine whether you have a debt problem. And, if you do, we’ll show you how to get out of debt. We’ll provide you with the proper tools and resources to dig out of your debt problem. I should have known it was a bad sign when I called the customer service line for a tech gadget I was thinking of buying, and the CEO answered. It can be a good sign when a CEO answers customers’ calls — it could mean he’s highly involved in the company. But looking back on it now, I see it as a possible sign that the company doesn’t have enough workers and that its gadgets aren’t worth hiring people to promote it. I wish I would have figured that out before I bought one of the devices at Ambient, only to see the company stop offering support for it less than three years later. It was 2011 and I was doing research for a story I was writing about energy saving gadgets when I saw the wireless devices Ambient was selling. One was called an Energy Orb that changed color when your household energy use changed. I called because I had some questions about its products, and was surprised when the CEO and co-founder answered. We talked for a bit, and I moved on with my story, eventually buying the Ambient Baseball ScoreCast for $43.82 on Amazon. About 2-1/2 years later, Ambient stopped supporting the device. The ScoreCast was introduced in 2008 for $125, providing baseball scores through radio signals. A wireless plan isn’t needed. My wife and I are big baseball fans, so I thought it would be fun to have the gadget on the fireplace mantle so we could see updated scores. Believe it or not, we didn’t have smartphones in 2011, so we didn’t have the immediate access that we now do on many devices in our home. I emailed him back, asking him what a consumer’s expectation should be when buying a tech device. I haven’t heard back yet. How long should a gadget last? Ambient’s pulling the plug got me wondering what consumers should expect when buying a tech gadget. Will the startup company that you were so fond of be around seven years from now when your device dies or needs tech support? There are hundreds of algorithms companies use to score consumers, and even the most common credit scoring company has dozens of models. Fair Isaac Corp., more commonly known as FICO, has about 50 scores (a 2012 report from the Consumer Financial Protection Bureau puts that number at 49). How can there be so many variations on a single score? It’s a confusing issue to consumers, particularly because “the FICO score” sounds like a single score. For starters, the information on each of your credit reports from the three major credit reporting agencies — Equifax, Experian and TransUnion — may vary, so that alone can give you three different numbers from one credit score model. However, one of the biggest reasons there are multiple FICO scores is because lenders assess borrowers differently, depending on the loan product. For example, a lender considering you for an auto loan will be much more interested in your history of auto loan payments than a lender considering you for a personal loan. FICO has different models tailored to the loan product the consumer applies for. On top of that, FICO creates custom scores for its clients, and FICO has updated its general formulas over the years. In 2014, the company announced FICO 9, its newest version of the basic algorithm, which does not include paid collection accounts in its scoring system and counts medical debt differently than other debts, because medical debt is often an unplanned expense beyond the consumer’s control. Perhaps the most puzzling part when it comes to understanding FICO scores (or any credit score, really) is not knowing which model your potential lender uses. You might check one of your FICO scores religiously, but you still might not know exactly what a future creditor sees when it processes your application. While it’s important to check your credit scores — you should do so regularly, and there are many ways you can see your scores for free — keep in mind that scores fluctuate and you also can’t be certain what your lenders look at. The best thing you can do is focus on the fundamentals of good credit: Make payments on time, keep your debt levels low, avoid closing old accounts if possible, maintain a good mix of accounts and apply sparingly for new credit. FICO has a program called FICO Open Access that allows customers of some partner institutions — like Discover and Barclaycard — to see their FICO scores for free. You can also get two free credit scores from Credit.com every 30 days, with a progress report of how your credit has changed over time.